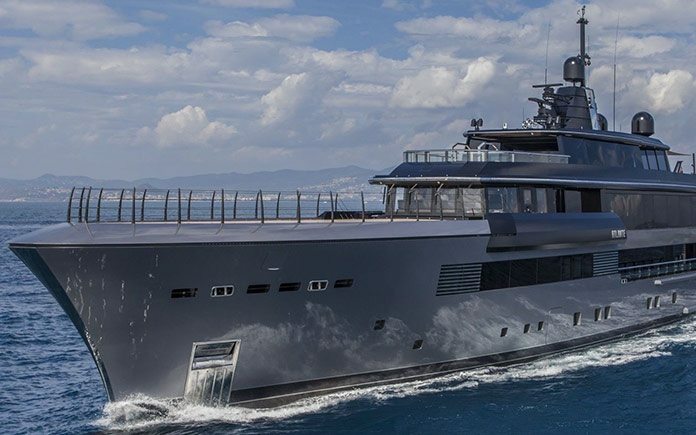 CRN Yachts, a shipyard specialising in the construction of recreational craft made of steel and aluminium super yachts, in lengths of 50 to 90 metres, is ready to launch its new fully customized 55 meters superyacht with a very strong identity and style, which draws on some stylistic features peculiar to military vessel. The shipyard has currently two yachts under construction: M/Y 131 74 m and M/Y 134 55 m, as well as the refitting of a 46 m craft. At the end of 2014, the contract for a 77 m vessel – currently undergoing the planning stage – was also signed. The commercial activity of the shipyard continues with several important negotiations, in line with the aforementioned industrial strategy. Using engine-powered hydraulic lift trucks, the mega yacht CRN 134 55 MT was positioned on the slipway, – 17th April 2015 – the ramp where over the next few weeks the pre-launch operations will be completed as moving a yacht of this size is always a complex operation, which requires the involvement and skills of the all the shipyard workers. This yacht already shows all its personality on the slipway. Very marked square shapes, sharp, rigorous and particularly sophisticated lines are the distinctive features of the CRN’s new mega yacht, the exterior of which was designed by the Nuvolari Lenard design studio, whereas the interior was designed by the CRN Interior & Design department in association with the Gilles et Boissier architectural studio.